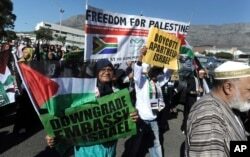 Protesters take part in a march to parliament in Cape Town, South Africa, May 15, 2018, to protest against the use of deadly force by Israeli troops against Palestinians at the Gaza border on Monday. Among the protesters — many of whom wore shirts that read, “Free Palestine” and “End Israeli Apartheid” — was a small group of people who identified themselves as members of a group called South African Jews for a Free Palestine. “It is a really important move for South Africa to start taking a stand,” said a young woman, Rosa, who asked that we not use her full name but who other protesters confirmed is a member of the group. "And I think it’s really important that the South African government is hearing the voices of the people who are saying, ‘We can’t just watch, we can’t just let children get murdered, we can’t let civilians get murdered,’ and this is, I guess, a small symbolic gesture where they’re starting to do something." Wendy Kahn, national director of the Board of Deputies, said the group was “disappointed” by the ambassador’s withdrawal. South Africa’s reaction is the strongest to come out of the continent. But it is not new, or surprising, says analyst Alfred Majaye Dube of the Institute for Security Studies. The divide, he says, dates back to the Arab-Israeli wars in the 1960s and 70s, which coincided with the early days of independence for many African nations. “I think as the years passed, Africa’s position on decolonization was very clear, and therefore by extension there was a very strong feeling that Israel was in violation of various resolutions of the United Nations in terms of the occupied territories,” he told VOA from Addis Ababa, Ethiopia. And, when the United Nations voted overwhelmingly last year to reject the United States’ move to recognize Jerusalem as the Israeli capital, only one African state - the tiny West African nation of Togo - voted with the United States and Israel.